Hungry Harvest contacted me and offered to sponsor this blog post in exchange for my honest thoughts on their service. I’m so glad they did because their missions of fighting food waste and hunger are causes dear to my heart. Hungry Harvest is a produce delivery service, curating fresh rescued fruits and vegetables to deliver to your doorstep. They currently service Maryland, Washington, DC, Virginia, Greater Philadelphia, Southern New Jersey, Northern Delaware, South Florida, The Triangle Area in North Carolina, and the Detroit Metro Area. Their boxes are customizable and come in a variety of sizes and options. 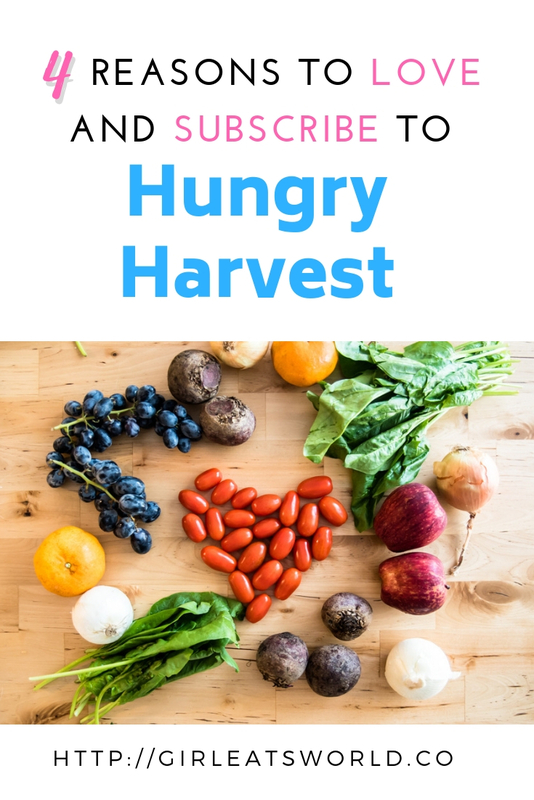 Below are 4 reasons why you should love and subscribe to Hungry Harvest. 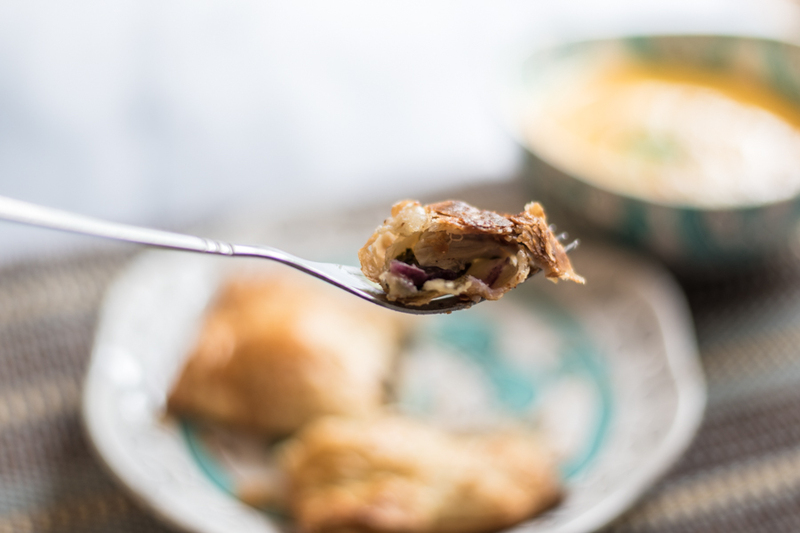 After my list of reasons, I’m sharing my delicious grape and chicken turnover recipe and linking to a few other recipes, all of which I tried with the produce Hungry Harvest delivered to me. And if you make it all the way to the end, there’s also a giveaway opportunity and discount code! Did you know that every year, 40% of food goes to waste in this country? I try to be mindful in eating down my groceries and not wasting food in my own home. But we can all also help with food waste by changing how we source and buy your groceries. Ugly produce hardly gets picked by consumers at the grocery store or farmstands. I try to remember this when I buy groceries. I might ignore the gorgeous bell pepper for the one that is slightly bruised that will taste just as wonderful when I’m done cooking with it. Hungry Harvest saves delicious produce that may otherwise be ignored because of their lack of conventional beauty and thus making a big impact on how much food gets thrown out at the market level. 2. Help fight against hunger. 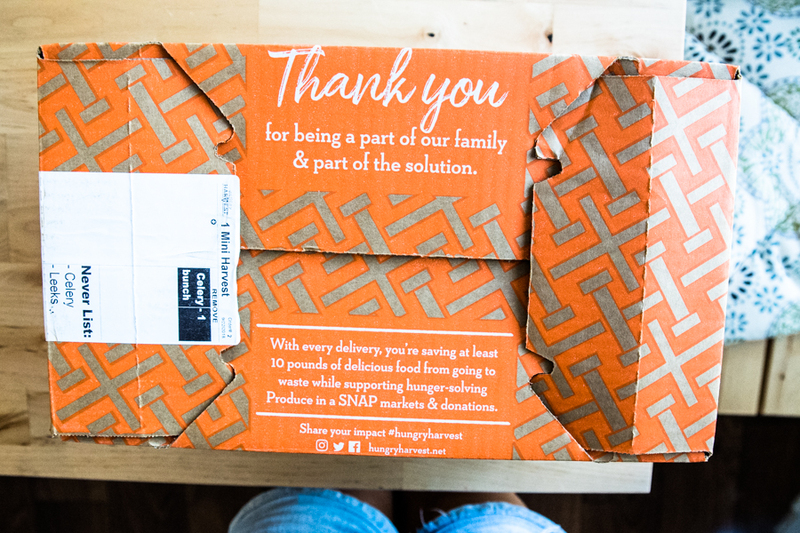 Another reason to love and subscribe to Hungry Harvest is to support a company whose mission is to also fight hunger. One of their strategies in fighting hunger is to donate a portion of their produce every week to hunger-solving organizations. You can see a list of their donating partners on their site. 3. Enforce healthier eating habits. I still struggle with making consistent healthy decisions when I buy groceries. I may buy just one bunch of spinach and count that as done for the week. 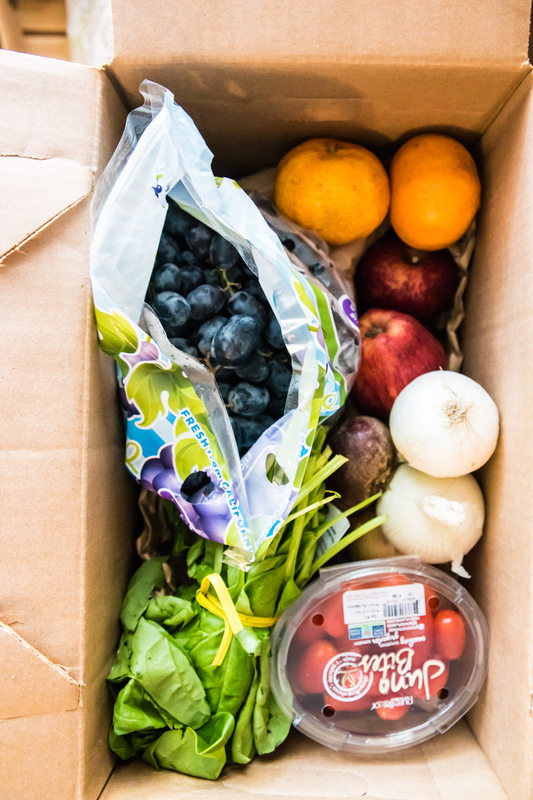 With Hungry Harvest subscription, you’ll have an entire box of produce that will inspire and positively reinforce consistently nutritious decisions in your home-cooking. 4. Help you climb out of boring home-cooking ruts. These Hungry Harvest deliveries are fun surprises that will inspire you to think outside your usual routines. I never think to buy apples or grapes, and both ingredients popped up in my delivery. The grapes got my creative juices flowing and I made a new recipe where I cooked grapes for the first time in my life! 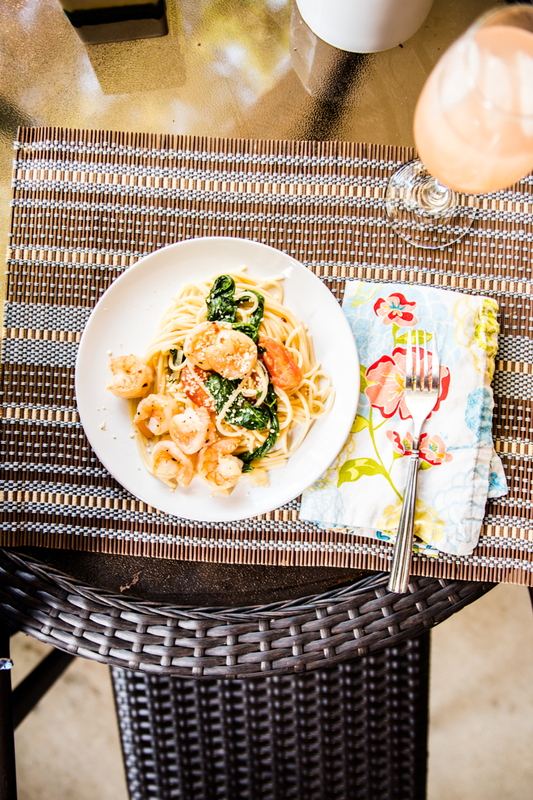 See below for the recipe I created with Hungry Harvest as my muse. I also made a soup with the apples that will now be in my fall rotation! As mentioned, I was inspired to cook with the grapes that came in my Hungry Harvest box. Sugarface is allergic to raw fruit skins and this includes grape skins. Rather than going through the trouble of peeling grapes for him to enjoy, I decided to cook them to make them safe for him to eat. Turns out they go wonderfully baked with cheese and chicken! 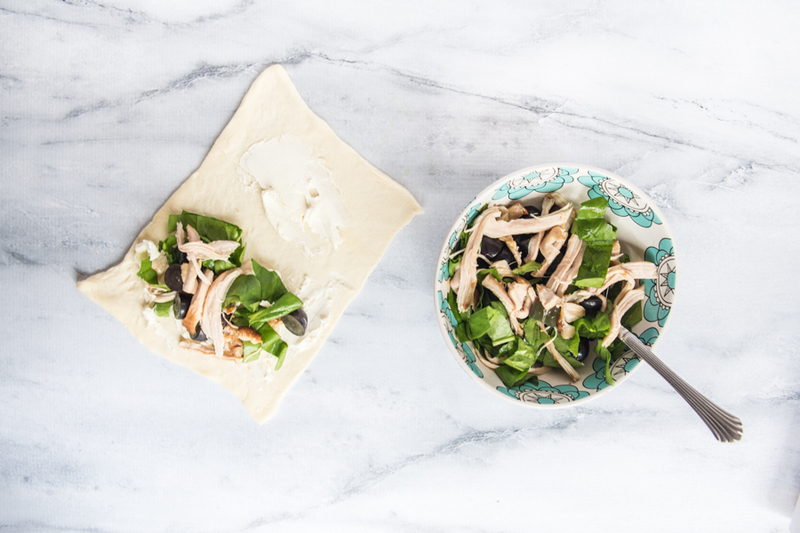 Add the shredded cooked chicken, spinach leaves and grapes to a bowl and toss. Add salt and pepper to taste. Beat the egg in another bowl. Brush the edges of the pastry rectangle with egg wash. Fold the half of the sheet without the mixture over the half with the mixture, essentially making a pocket. Brush the top of this pastry with egg. This will give the baked pastry a beautiful golden color. Then repeat steps 4 to 6 with the remaining puff pastry rectangles. 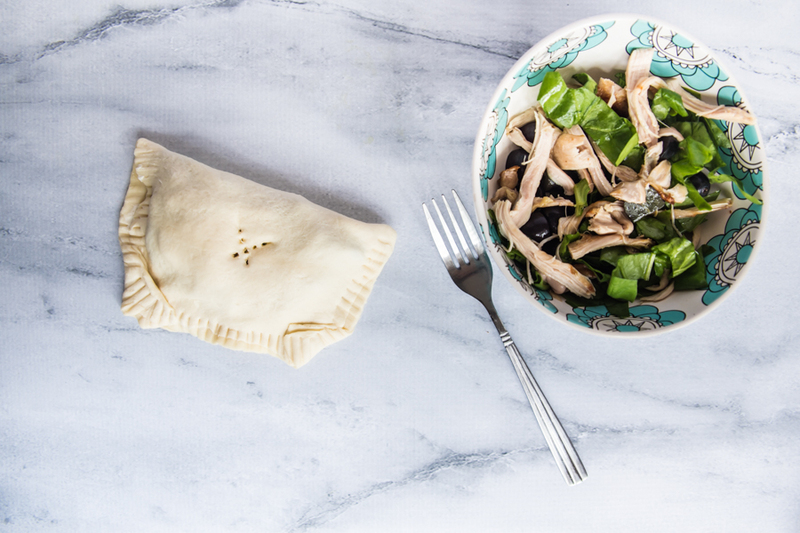 Set these four pastry turnovers on a greased baking sheet. Bake for 20-25 minutes or until golden brown. Lastly, let sit for a few minutes before serving. 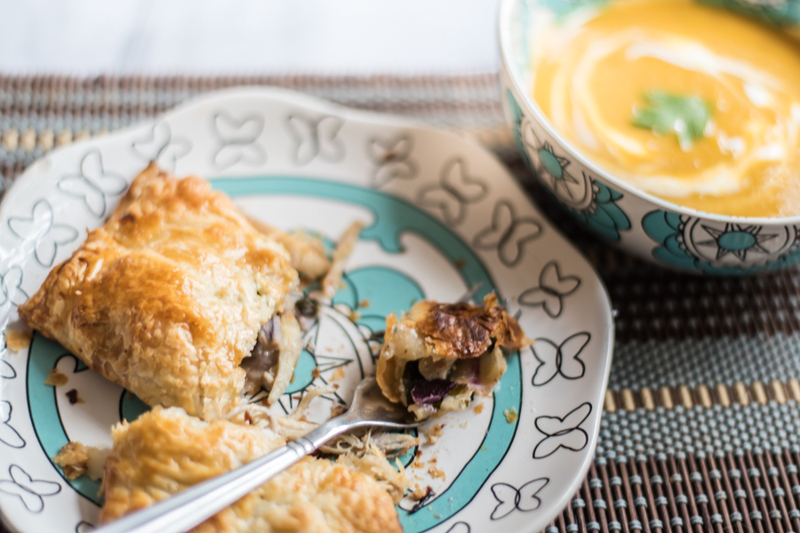 Pair with a soup or salad. If you are using black or purple grapes as I did, don’t be alarmed if you see a little creamy purple color. That’s just the grapes giving you a surprise coloring! Sugarface and I both loved this comforting dish. 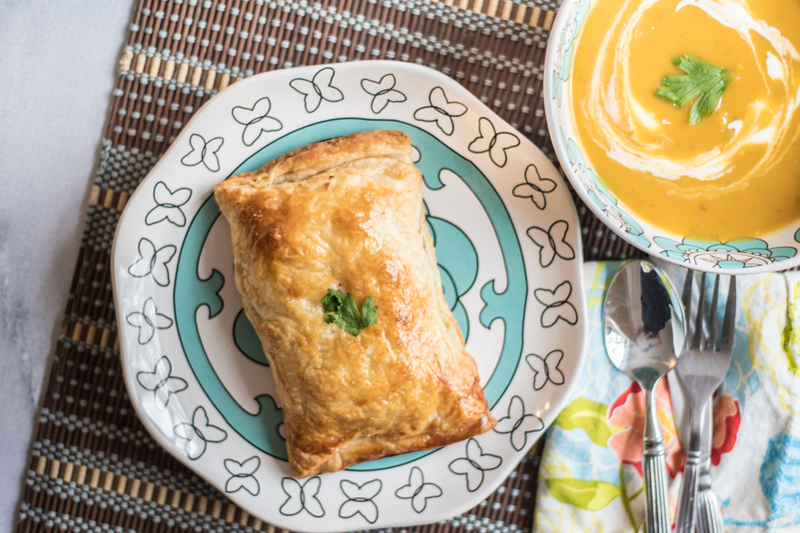 I served it with a delicious apple and sweet potato soup, recipe linked below. Sweet Potato and Apple soup. Finally, that concludes my fun experience with Hungry Harvest. I’m so excited about this company that I am happy to partner with them to give away a month’s worth of Hungry Harvest deliveries and also offer everyone else a discount code! 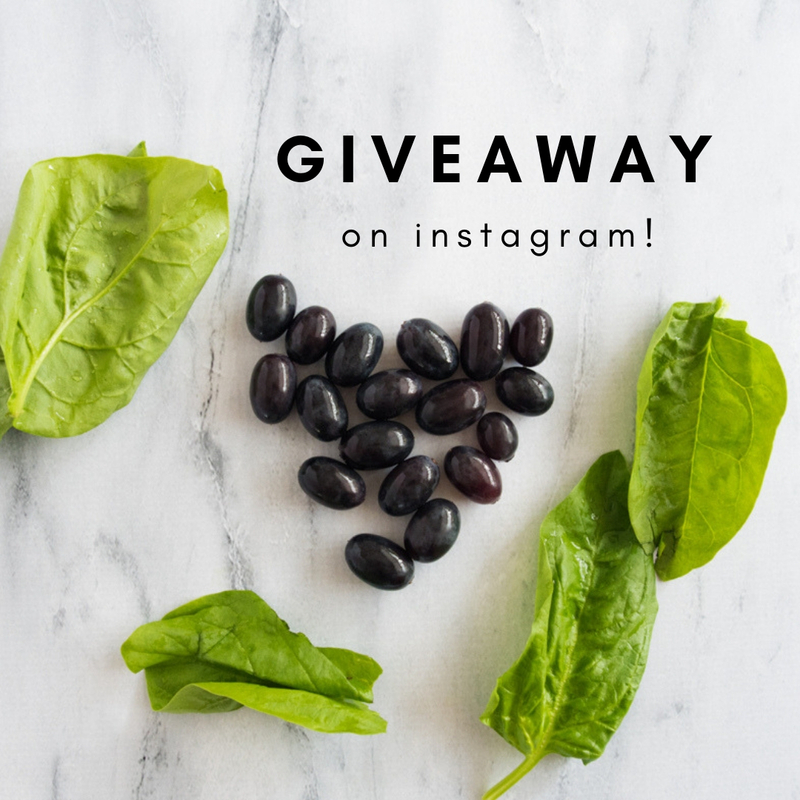 To enter my giveaway, visit this Instagram post and follow the rules listed. Now over to you! How do you help prevent food waste in your everyday life? Leave a comment and let me know! Follow my eating adventures and happenings on Instagram. 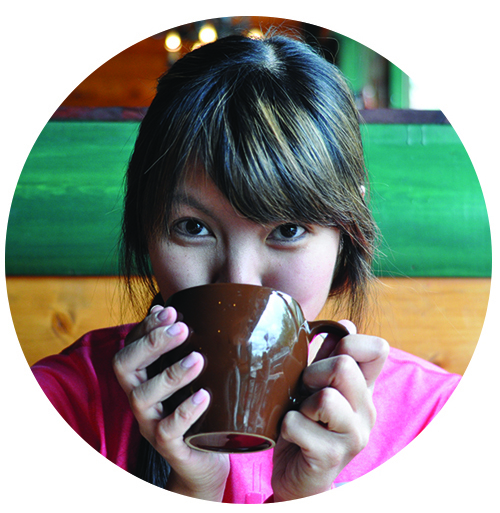 You can also see what is catching my attention in the food world on Twitter and Facebook.